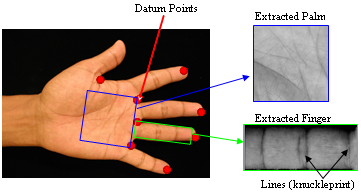 A number of biometric characteristics can be extracted from an acquired image of a hand: Palmprint, hand vein, hand geometry, images of the fingers. According to the security requirements such biometric characteristics can be used in a unimodal system or they can be combined in a multimodal system, which has the advantage of requiring a single acquisition device. A palmprint contains mainly three types of information: texture information, line information, and appearance based information. Most of the papers proposed in the literature for Palmprint verification are based on a single Palmprint representation, and this fact can be considered as a bottleneck for the performance. The Biometric System Laboratory proposed a very competitive palmprint verification system based on an ensemble of matchers the exploit the fusion of several Palmprint representations. The inner cuticle in a finger contains much more lines, wrinkles and ridges than in a fingerprint. These patterns are formed even before born and determined by gene, thus can be used in biometrics. The image quality required for extracting these wrinkles and lines is quite low, thus, their features should be very robust. In particular the lines in the inner skin of knuckle, named knuckleprint, have shown to be suitable for biometrics since they are quite easy to extract (they present high contrast) and the are unchangeable according to one's physical condition. Moreover the performance knuckleprint verification systems can be improved combing matchers based on different fingers (e.g. the ring finger and the middle finger) or on different features. Some features related to a human hand, (e.g. length of fingers), are relatively invariant and peculiar (although, not extremely distinctive) to an individual. The image acquisition system requires cooperation of the subject and typically captures frontal and side view images of the palm placed on a panel with outstretched fingers. The representational requirements of the hand are very small (typically less than 20 bytes), which is an attractive feature for bandwidth- and memory-limited systems. 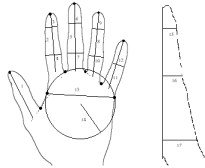 Due to its limited distinctiveness, hand geometry-based systems are typically used for verification and do not scale well for identification applications.